Lei Ming — Ray to his English-speaking friends — will only be in the U.S. for a few more months and there is no way to know if he will ever be able to come to the States again. 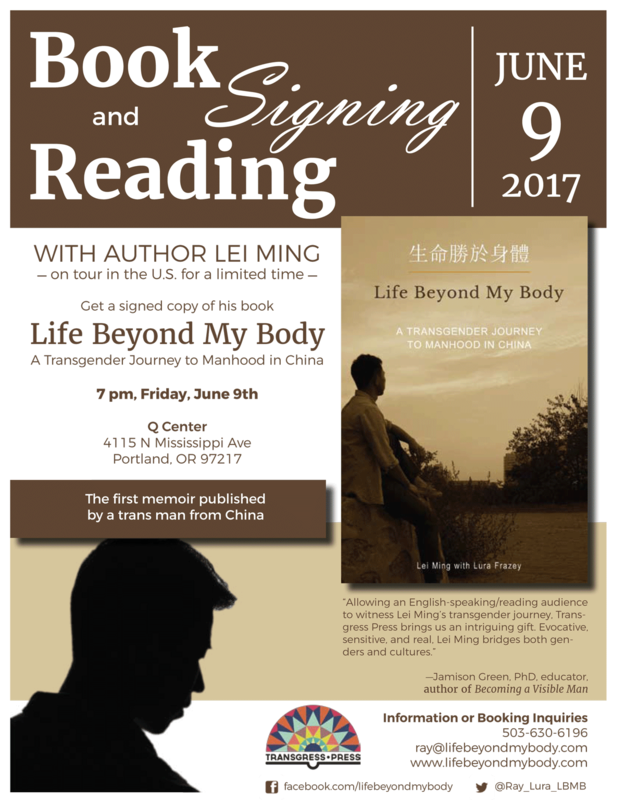 This is truly a not-to-be-missed chance to meet the first known trans man to publish his memoir. Life Beyond My Body brings an international perspective to trans issues and showcases the hardships trans people face in underdeveloped countries. What is like for a trans man to deal with public restrooms that have no walls? Navigate a culture that has never even heard the word transsexual and believes he is possessed by demons? Transition using black market testosterone? Find out June 9th at the Q Center. This is event is free and open to the public. We look forward to seeing you there!